Escalating religious persecutions worldwide have brought together international leaders in Oslo where they talked about faith and belief. After two days of meetings, lawmakers representing 30 countries have signed the Charter for Freedom of Religion or Belief. It is a statement reaffirming "the right to freedom of thought, conscience and religion" contained in the Universal Declaration of Human Rights. The charter was signed by the parliamentarians at the Nobel Peace Center in Oslo earlier in the month, on November 3. One notable lawmaker who signed the Charter was Asiya Nasir from Pakistan. She holds a reserved seat for Christians in Pakistan's National Assembly under the Islamic JUI-F party banner. "This historic event brought together individual parliamentarians from a wide range of nations and religious communities in a united effort to galvanize support at a time when religious freedom increasingly is under attack," said Katrina Lantos Swett chairwoman of the U.S. Commission for International Religious Freedom (USCIRF). Countries represented included Argentina, Brazil, Burma, Canada, Costa Rica, Dominican Republic, Germany, Italy, Malaysia, Nepal, Norway, Pakistan, South Africa, Sri Lanka, Turkey, United Kingdom, and Uruguay. In addition, from the United States two commissioners from the U.S. Commission on International Religious Freedom participated, as well as the U.N. Special Rapporteur on Freedom of Religion or Belief. "Our main goal is to use our position as legislators from different countries, political parties and faiths to try and change the reality on the ground for those being persecuted," Baroness Elizabeth Berridge of Britain told the World News Group. She said this just the beginning and noted resources are needed for the initiative to push through. The delegates sent a formal letter to Pope Francis to inform him of the group's initiative. Letters were also sent to the heads of State of Myanmar and Pakistan, countries were religious freedom is often restricted. 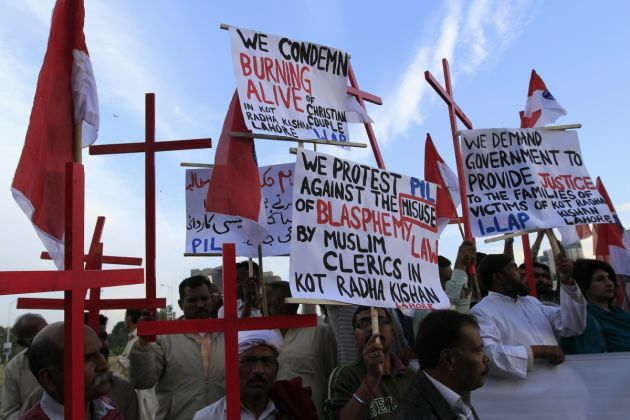 The letter to Pakistan asked Prime Minister Nawaz Sharif to intervene in the case of Shama Bibi and her husband Shahzad Masih, a Christian couple burned alive in the country.